Proposed model for a role of ROCK1 in hepatic metabolism. Upon high-fat feeding, the endocannabinoids 2-AG and AEA are produced and released from hepatic stellate cells of the liver. Once endocannabinoids bind to a cannabinoid receptor (CB1) on the cell surface of hepatocytes, ROCK1 is rapidly activated and subsequently inhibits AMPK, leading to stimulation of the SREBP1c-mediated lipogenic pathway. As a result, hepatic lipid accumulates. 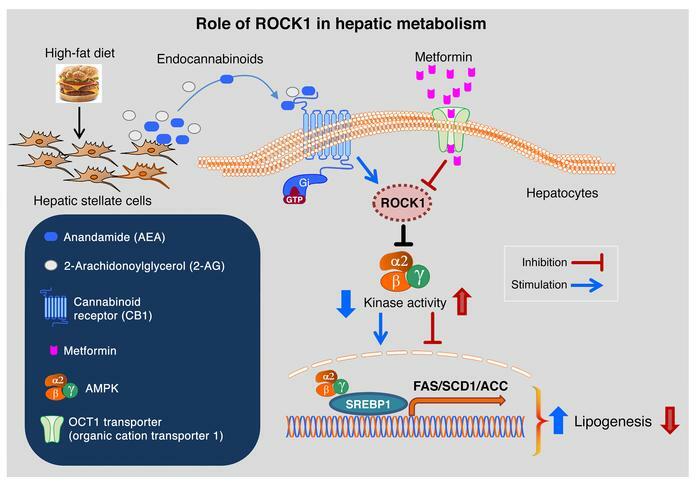 In contrast, an antidiabetic drug, metformin, suppresses ROCK1 activity but stimulates AMPK activity, which contributes to decreased lipid accumulation in hepatocytes. Thus, we propose a novel signaling pathway for hepatic fatty acid synthesis that is regulated through a ROCK1-dependent mechanism, negatively engaged to AMPK.